It is Located in the western central coast of South America, where you can find all the climates of the world. Heiritor to ancient cultures, with thousands of archaeological sites and a rich colonial tradition. With an area of 1,285,216 km², Peru is among the 20 largest countries in the world and is the third largest country in South America after Brasil and Argentina. Borders: North, Ecuador and Colombia, to the east Brasil and Bolivia and to the south beside the Pacific Ocean Chile. The Peruvian territorial sea comprises a wide belt of the Pacific Ocean that reaches 200 miles (371 km), measured from the shoreline. And it has territorial rights over an area of 60 million hectares in the Antartic. 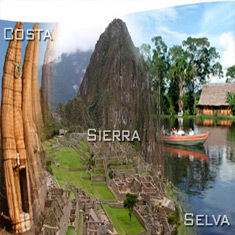 Peru's climate is very varied, summers and winters will happen in different ways according to the regions. Under the effect of the cold Humboldt current and the presence of the Andes to the east the Coast is the shape of a extensive arid desert. The central and southern Peruvian coast has two different seasons: Winter, between April and October, and summer between November and March. During the Winter heavy Shell of clouds covered the skies and frequent drizzle. Tempertures rarely dip below 12° C during the summer, while the tempertures can often reach 30° C. the northern región of the coast however does not suffer the effect of cold currents, resulting in nearly 300 days of sunshine and warm tempertures throughout the year (up to 35° C in summer). Which increases remarkably with the presence of the climate phenomenon “El Niño” every 4 or 5 years. The highlands have two different seasons: the dry season (or Andean summer) between April and October, sunny days characterized by very cold nights (this is often frost) and the absence of rain making it the ideal time to visit. With a rainy season between November and March, where rainfall is abundant (generally above 1,000mm). The highlands climate makes it ideal for growing a wide variety of crops. The forest can be divided into high jungle or mountainous areas (above 700masl) and lowland (below 700m) the first has a mild subtropical climate with abundant rain (about 3,000mm per year) between November and March. And sunny days between April and October. The nights are always cool. For its part the low jungle offers two well-marked seasons, which are accentuated in direct relation to the distance from the Equator. The summer season or dry season, between April and October (good time to visit), is dominated by sunny days and high throughout the year. In the south there are occasional “cool” strong cold winds from the far south of the continent that present between the months of May and August when the temperature can drop to 8-12 ° C.